Unified Communications can make a major difference to your business, regardless of size or industry sector. In its broadest sense Unified Communications brings together all the various forms of communication that can reside on an IP network such as telephony, e-mails, instant messaging, presence and video conferencing. Employees can manage all these different communication types from one central platform. Why do I need Unified Communications? Most of us these days use lots of different forms of communication to interact with each other. 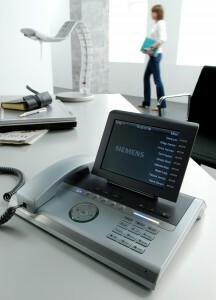 This can be via land lines, mobile phones, faxes, instant messaging, web conferencing, texting and so on. A Unified Communications (UC) solution will bring all these systems together in one place. 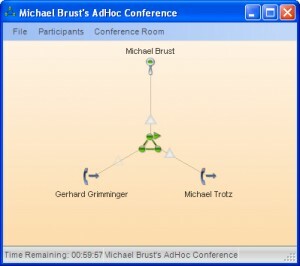 The benefits include such features as a simple drag and drop from your list of contacts to host an Ad-Hoc Call Conference (see image on left). You could, for instance, give your customers a single phone number that will contact you whether you are in the office or not (the system automatically redirecting the call to whichever device you choose based on your Presence). Other people in your organisation can see at a glance if you are in the office, at home, on the phone etc. UC can save you money by utilising your broadband to make calls (SIP). All calls over the same network are free which is great if you have multiple branches or work from home with a VPN connection. You can easily add remote workers to your UC system via an internet connection and they immediately have all the facilities of your UC solution wherever they may be. It is an easy process to record a call either at the beginning or at any point during the conversation.